This blog post was originally published on April 7, 2015. You’ve made your grocery list, or you swing by the store to get some staples for the week ahead. Like many of us, you’re on a budget, so you’ve got an eye for deals and saving money. As you scan your food options, you notice that in addition to the many eye-catching (and slogan-worthy) brands offered for your favorite foods, there are also those more plain, but much cheaper options. And you ask yourself: Is saving the money worth it? Is that food going to be as good? I’ve often wondered this myself, and took some time to learn about the differences between generic and name brand foods. A note before I tell you my findings: these areas really do vary widely depending on the type of food, the store you shop at, etc. It’s actually hard to make generalizations about ALL generics versus ALL name brands, because even within these categories, the quality, price, and marketing can vary widely. But below is a summary of what I found to be true. 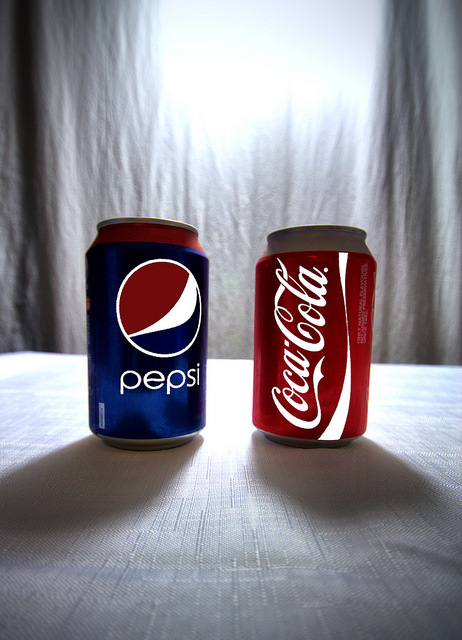 “The Eternal Struggle of Coca Cola & Pepsi Cola” by Simon & His Camera Flickr Creative Commons. Name brand- Name brands are familiar or widely known, and often are associated with trademarked products. Generic Brand– Generic brands are lesser known than name brands, partially because, they are much less aggressively advertised to public. Packaging is often more plain than name brand products. You may not know these products by a store brand or name brand logo, but you can see the difference when you look at the product. 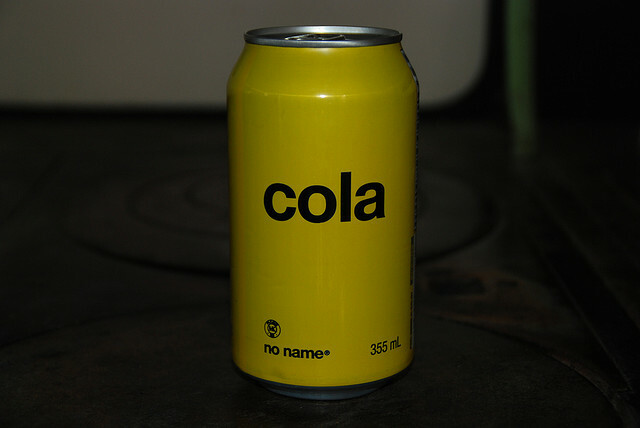 For example, Coca Cola is a name brand, but a generic brand soda of the same variety will often just be labeled “cola”. Of ten these products are branded based on the store they are in (see below). “Sorry…What Exactly Is In This Can Again” by Paul Jerry. Flickr Creative Commons. Store Brand– Supermarkets or other stores offer their own line of foods that are manufactured especially for that retailer. Examples of food product store brands are Target’s Market Pantry or items sold at warehouse stores under their own line, such as Costco’s Kirkland Signature products. There are more options than just name, generic, and store brands, and there are even levels within these for “premium” (think Kroger brand versus their “Private Selection” line of products) or “value” versions. For the sake of simplicity and not falling down a rabbit hole, we will just consider these three primary types of products. In an experiment conducted by Consumer Reports, they found that “store-brand foods cost an average of 27% less than big-name counterparts.” One reason that generics (including sore brands) are often lower cost is that there is little to no money spent on promotional efforts for these products. So is there a difference in quality of these food products, or is it all just a marketing scheme? Well, it turns out it depends on the product you are buying. When Consumer Reports (one of the only research sources I could find to really get the scoop on branding of food) conducted a huge amount of blind taste tests to see if people noticed a difference between different brands of foods, the majority of the time the taste test ended in a tie. There seems to be little difference in the quality of staple products, such as flour, sugar, and some types of cereals. Non-perishable items, such as canned goods, are also good bets for little difference in taste/quality. 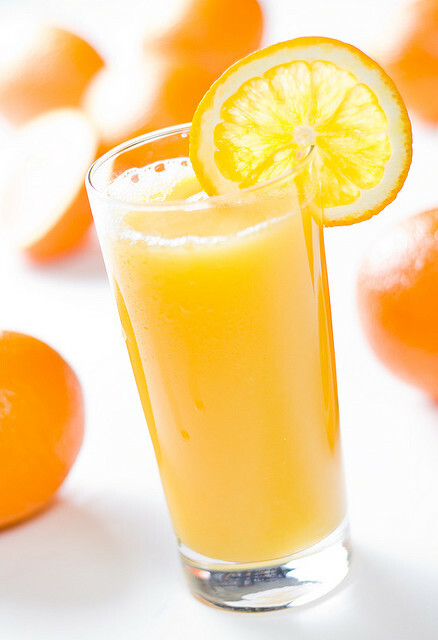 “Orange Juice” by Placbo. Flickr Creative Commons. milk, for example. Some report that it’s best not to take a risk on generic brand dairy products, because of the pasteurization process, while others say it is better to use store brands or generics because it is more likely they were regionally made and distributed, making them fresher. This may or may not be true, as Time magazine reports than many products from store brand lines are actually made at the same places as name-brand products. Even more interesting is that a report from the Integer Group estimated only 26% of consumers actually have a preference at all when it comes to their milk brand choice. It seems that generic versus name-brand food products also vary widely based on the brand itself. For example, Whole Foods’ store brand is probably more nutritional and tastes better than a superstore brand, partially because of the ingredients used in these products. Whole Foods overall is going to have lower preservatives and use more fresh, whole ingredients, which impacts both taste and nutrition of the item. 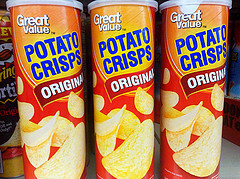 “Pringles Store Brand “Great Value” Potato Crisps from Wal-Mart” by Mike Mozart. Flickr Creative Commons. Identify, and stick to, what’s important to you. What are your top concerns: cost? food sourcing? quality? This may differ depending on the product you are seeking. Check the label: look for additives, sugars, and quality grades between generics and brand name. If there are a lot of ingredients that you can’t pronounce or identify in one or both products, it may be good to seek an alternative. Keep in mind that staple foods, such as non-perishable items, frozen fruits & vegetables, etc. are often okay bets to deter from your recognized brand name foods, especially if you are trying to save some money. So what do you think? Do you have any favorite generic or store brand foods? Or have you ever had a bad experience going name brand versus generic? Share below! Stay tuned in the future for what I learned about the differences between brand and non-brand names in terms of medications! Also, if you are interested in the brand name differences in condoms, check out one of our earlier blogs!